In part 1 of this series Free Yoga DVD for Beginner’s, the first 12 minutes of this Kundalini Yoga DVD was presented and the breathing exercises and yoga poses were explained in detail. The dvd is that of a Kundalini Yoga class I conducted and in this part I will present the next 12-15 minutes of the class and explain the contents as well. In case anyone is curious, the reason for breaking up the dvd into these chunks is due to YouTube’s limit of 15 minutes for the free videos that can be uploaded . So below you will find the next section of the DVD. As I mentioned in part 1, by uploading these videos of a live class, I am looking to give you a real sense for what doing Kundalini Yoga is like and of course, we also get to learn and practice these exercises together as well. In part 1, the DVD left off with us practicing our starting yoga breathing exercises and warm-ups, here it picks up where we left off as the class moves onto the powerful Kapalbahti Pranayama. You will notice that I am constantly reminding the students that in Kundalini Yoga they are most welcome to pace themselves and that it is not a competitive activity. This is quite an important lesson to keep in mind, that you should constantly be listening to your body and not over doing anything. The DVD then moves onto the great Spinal Warm-up set, which is probably the best way to start your Kundalini Yoga exercises. This set in and of itself is excellent for your digestive system, excretory system and for your entire back and spine. It is wonderful for stretching and getting warmed up prior to more difficult exercises and sets. It also gets the Shushumna Nadi, the central channel for the conduction of Kundalini Energy, ready to begin it’s work. The Kundalini Yoga Spinal Warm-up Series is a set of several exercises and movements. These include, Stomach Grind, Camel Ride, Cat-Cow, Spinal Twists, Shoulder Shrugs and Neck Rolls, and in this DVD the first 2 are demonstrated. The others will be in part 3 of this video series. Here is another good free video exclusively of the Spinal Warm Up Series and the article below that link has all the details of the exercises as well. You can watch the video directly on YouTube or in the article link below. As you can see, in Kundalini Yoga, quite a bit of time is spent doing the breathing exercises and warmups. The pranayamas are really good for you and the proper warmup ensures you will not get yourself injured during the set. The next few sections of this dvd will go into the more intense yoga exercises and poses that compose the set, so stay tuned for those in the near future. 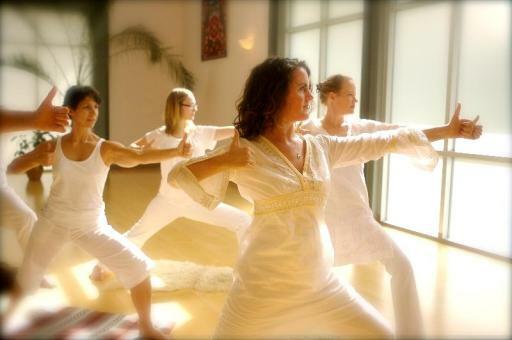 One more avenue I am exploring is doing web based live Kundalini Yoga classes. I will update everyone on the progress with that as it matures.